There were 6,906 people recorded as homeless on census night 2016. EARLIER THIS WEEK, figures from Census 2016 painted a picture of the homelessness situation in Ireland. It showed that there were 6,906 people recorded as homeless on the night in April last year when the census was taken, 123 of whom were sleeping rough. Among those people who were homeless, 1,871 persons indicated that they had a disability. That adds up to a disability rate of 27%, double that of the general population. Disability adds an extra layer to the problems of those who are homeless and also makes finding suitable accommodation more difficult. For example, it’s estimated that there are 7,600 people with disabilities on social housing waiting lists around the country. 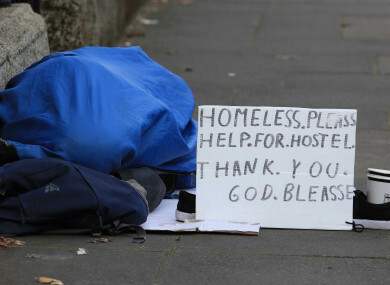 Deputy CEO of the Disability Federation of Ireland Allen Dunne describes the disability rate among homeless people as a “crisis within a crisis”. “We find this fact totally unacceptable, but sadly not surprising when all major indices show a worsening situation for people with disabilities,” he explains. Homelessness is set against the backdrop of a housing crisis. For people with disabilities that is a crisis within a crisis which is even more chronic than that suffered by the general population. The logical result of this is people with disabilities on the streets. The high disability rate among homeless people is part of the wider issue of a lower than average level of health and wellbeing among disabled people. The DFI points to research which shows that the consistent poverty rate among disabled people rose from 14% to 22% in 2015 alone. This is in addition to figures which show that 69% of working age people with a disability are not currently at work. The Simon Community said in response to the census figures that it has not conducted any research on the specific issue of disability within homelessness but that it is one which its support teams encounter regularly. Email “'For people with disabilities this is a crisis within a crisis'”. Feedback on “'For people with disabilities this is a crisis within a crisis'”.